It’s something we’ve all felt. The low, sinking kick in the metaphorical groin when you’ve read some tweet or post, expounding on some previously unknown spoiler. But maybe, social media doesn’t need to be such a minefield of potential despair. Well, it seems Google is working on it. 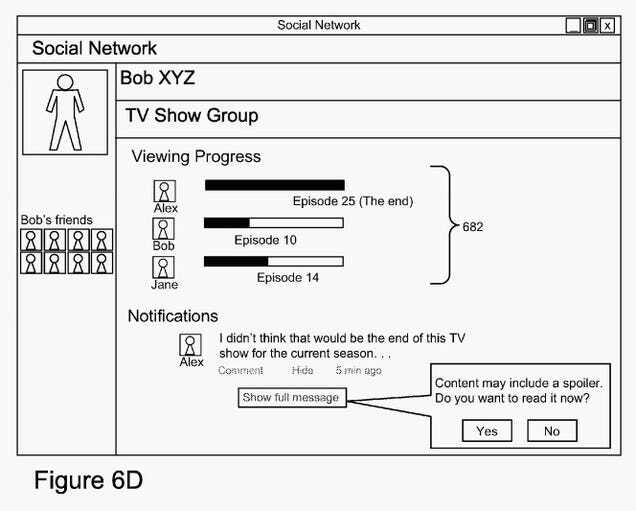 A new Google patent, spotted by Quartz, details a new system that would keep track of your progress on whatever shows, books, and movies you wish and block posts it thinks might contain spoilers. It doesn’t completely obliterate the post but instead blurs the content with a pop-up warning. In this above example, Bob’s soon-to-be-ex-friend Alex just tried to ruin some show with his irresponsible post, but this friendly (unlike Alex) pop-up stopped the worst thing from happening. Of course, there are a lot of unanswered Qs. The biggest one being how Google plans to overlay this service on social networks it doesn’t own because if it’s only on Google+ I mean who really cares.